Now that the gorge is melted off the main river channel and the air temperatures have stayed in a much more comfortable fishing range the fish are of course, damn hungry and if you like easy fishing this is the time to get out there! Expect to be nymphing or streamer fishing. There are hatches of midges daily though so don’t discount the dry fly fishing either. Look for deeper holes and buckets where the fast currents slow down along inside edges and where you see green water, but remember, Madison fish aren’t afraid of some fast water so fish the faster current tongues where you’d think it was too fast for spring holding water. You’ll be pleasantly surprised. Get some buddies together and check out our Spring Specials to get in on the action! We’re seeing some very nice browns this spring when there are lots of rainbow’s in the river spawning. Check out our TOP 12 NYMPHS FOR CATCHING TROUT for a more complete list of flies to bring. 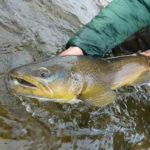 Spring offers some great streamer angling opportunities! Of course we love fishing streamers when in the spring and right now conditions are perfect! Steve here shows us how his efforts paid off! This is how you’ll feel after a day of floating the Madison River! WHOOLY BUGGER- #8-4 all dark colors and combinations. Read our WINTER STREAMER TACTICS to up your spring streamer game! The Madison is stuffed with a couple more thousand rainbow’s per mile like these! For more information on fly fishing in Montana and guided fly fishing trips please visit mtfishtales.com or call 406-451-2074.
and Permittee for the Madison, Big Hole and Beaverhead Rivers. Get fishing news, river reports and deals on fishing trips delivered straight to your inbox!